The brown marmorated stink bug (BMSB) is a new invasive insect that was first found in the U.S. in 1998 and in Iowa (Scott County) in 2012. See HHPN from October 17, 2012. Additional reports now indicate BMSB has been detected in 40 states with severe crop damage in 6 of those and some agricultural damage reported in 4 more. The remaining states are reporting household invasion nuisance only or detection. In Iowa, BMSB has been reported in 10 counties, primarily in eastern Iowa but earlier this year in Warren and Polk Counties in the center of the state and Council Bluffs on the western edge. See the map below. The BMSB is looks similar to other brown-colored stink bugs but is distinguished by the mottled brownish gray color and the alternating light and dark bands on the antennae. See photo below. The underside of the BMSB is pale in color. BMSB is compared to other similar insects on the Plant & Insect Diagnostic Clinic website and in ISU Extension & Outreach publication PM3012, Stink Bugs of the Midwest. We are continuing to track the distribution of BMSB in Iowa and would appreciate your reports. Submit suspicious stink bugs to your local county extension office or the ISU Plant & Insect Diagnostic Clinic. Reports can be made by emailing digital images to the Clinic at insects@iastate.edu. 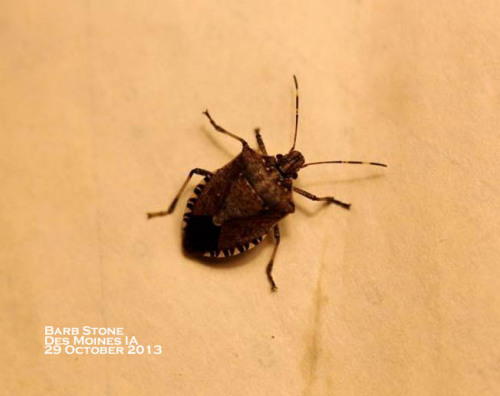 We have several native brown stink bugs that look similar to BMSB and are very common. Therefore, specimens or a clear, close-up digital image are necessary to confirm the presence of BMSB in a new county. Note the banded antennae that distinguish BMSB from similar species. Counties in Iowa where the brown marmorated stink bug has been reported. November 1, 2013. Links to this article are strongly encouraged, and this article may be republished without further permission if published as written and if credit is given to the author, Horticulture and Home Pest News, and Iowa State University Extension and Outreach. If this article is to be used in any other manner, permission from the author is required. This article was originally published on November 1, 2013. The information contained within may not be the most current and accurate depending on when it is accessed.